This past weekend I actually did something worth talking about! On Saturday morning I drove five and a half hours to get to Ottawa for my oldest friend's bridal shower and bachelorette. I stayed at a hotel downtown so that it'd be easy to get home after a night of indulging in wobbly pops. Thanks to Hotwire, I got the room for half price! We went for dinner at the Cornerstone Grill in the Byward Market and the food was great! If you ever find yourself downtown Ottawa and you're hungry I'd definitely recommend it. My friend and I were drinking Long Island iced teas by the pitcher. Where I come from, beer comes in pitchers. That's it. The novelty of this will not wear off for quite some time. We then went to a comedy show at Yuk Yuk's and the MC was actually the funniest guy of the night. No one gave my friend too hard of a time despite being dressed up in your typical bachelorette accessories. We ended the night at some bar that I can't remember the name of. It was 21+ which was kind of a relief...I pretty much hate the bar and being around drunken teenagers is not my idea of a good time. The next morning I checked out of my hotel, ate breakfast, and drove the five and a half hours back home. The drive home was much less fun since I was so tired. Not hungover, I swear. I made the decision to drive back roads all the way, and the extra bit of time it took was seriously worth it. If I didn't have this thing called a job or people in my life called friends and family, I would move to Bonnechere Valley Township. I drove past the most beautiful farm and I'm kicking myself now for not stopping to take a picture. There was an old abandoned farm in a wee little town called Sebright which was amazing, too. 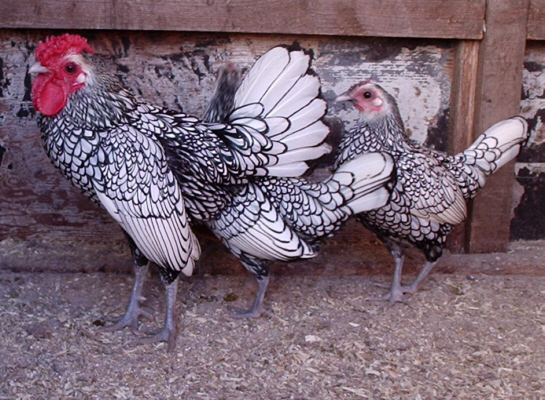 When I Google Sebright this comes up, though. And now I really want one of those chickens. I'm also pretty sure I saw a moose, but it could have been a moose shaped log and/or shrub. Either way it made me really want moose pepperoni. So that was my weekend. What'd you get up to?